I am honoured that my Fashion Freak Show will premiere at Southbank Centre. London is dear to my heart and a constant source of inspiration. Why See Fashion Freak Show? 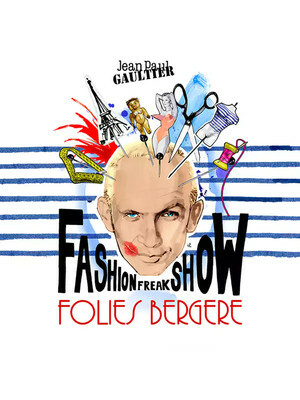 From the creation of Madonna's infamous Blond Ambition conical bras to championing full-figure models, French designer, author and director Jean Paul Gaultier has been an influential driving force in the worlds of haute couture and pret-a-porter fashion. Experience his outrageous genius in the flesh during Fashion Freak Show, a unique interactive experience coming to the Southbank Centre this summer! A chance to enter Gaultier's fantastical world, the exhibition is part revue, part catwalk show, part-autobiography. Amidst whirling dancers, actors and circus performers embodying fierce, off-the-wall creatures, the style icon's most memorable creations take flight against a projected video wall as he reminisces about memories from his childhood and throughout his storied career. To top off the twisted down-the-rabbit hole party atmosphere, exclusively designed costumes feature alongside interviews and sound bytes from Gaultier's posse of celebrity pals and supporters. Seen Fashion Freak Show? Loved it? Hated it? Sound good to you? Share this page on social media and let your friends know about Fashion Freak Show at Queen Elizabeth Hall. Please note: The term Queen Elizabeth Hall and/or Fashion Freak Show as well as all associated graphics, logos, and/or other trademarks, tradenames or copyrights are the property of the Queen Elizabeth Hall and/or Fashion Freak Show and are used herein for factual descriptive purposes only. We are in no way associated with or authorized by the Queen Elizabeth Hall and/or Fashion Freak Show and neither that entity nor any of its affiliates have licensed or endorsed us to sell tickets, goods and or services in conjunction with their events.